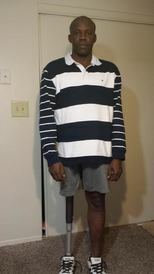 On behalf of my family, I would like to thank you for the donation of my new prosthetic leg that I received from the 50legs organization. Your support has helped me to continue my mission and also put smiles on my families face. The generous support of individuals like you and other members of the 50legs make it possible to walk on my 2 legs and to make the United States of America a great place to live. Thank you again for your support, I will forever be indebted. God bless 50legs, State of Florida, and the USA.